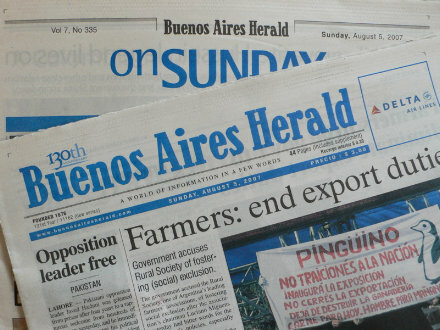 In both 2011 and 2015, I have relied heavily on the website of The Buenos Aires Herald for my news about Argentina, South America, the United States, and also the World. Every day, there is an article about the value of the dollar in pesos—both the official rate and the “blue” rate. Based on the photo above, it is also published in a newsprint edition, which I will check up on when I arrive in B.A. Occasionally, I will find stories which are not even well covered in the U.S. For instance, Israel has banned most Palestinians from the Old City of Jerusalem for a two day period during Jewish holiday observances. It is interesting to see that Argentina is still going hammer and tongs after the British for doing oil exploration in what the Brits call the Falklands and the Argentinians the Islas Malvinas. Firms that are involved may have their property confiscated if they should anchor at an Argentinian port.